TechDocs (techdocs.zebra.com) is the main documentation site for Zebra's development tools, and is intended for Zebra partners, developers, sales engineers, support teams and anyone seeking in-depth technical information. The site includes user guides, feature descriptions, usage scenarios, tutorials, sample code and links to discussion sites on the Zebra Developer Portal, downloads at Support Central and other information and resources. The video (below) provides a brief guided tour explaining the screenshots that follow. Below is the main TechDocs page, reachable at techdocs.zebra.com or by clicking the Zebra icon from within any product. Each product has its own "tile" with the product name linking to the "About" page and buttons to the product's main sections. When multiple versions of a product are documented, a drop-down list on the right side of the tile (shown) links to docs for each of the available versions. When viewing the docs of an individual product, a series of tabs along the top of each page link to the product's main sections and to other resources, when available (see image, below). A navigation pane along the left side displays anchor links to the main sections of the current page. Click an anchor link to scroll to that section; right-click it to copy the link for pasting into other documents or communications. 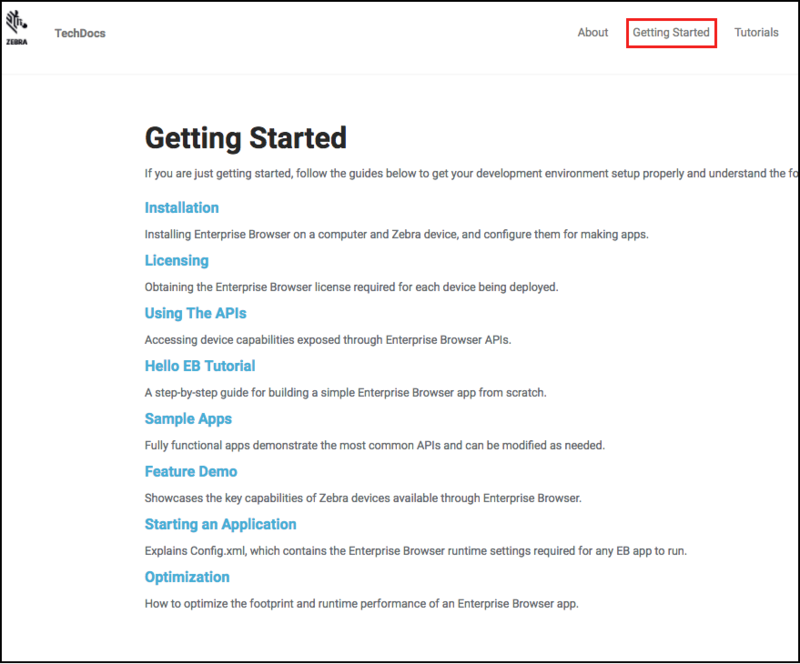 Some of the more complex products include a "Getting Started" page, an index of available guides designed to help new users set up and get up to speed quickly. These guides are meant to be consumed from top to bottom. 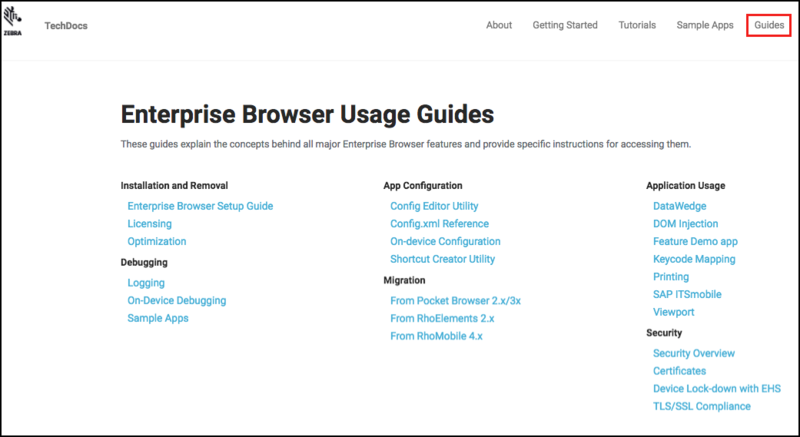 For feature-rich products such as Enterprise Browser, TechDocs provides numerous guides categorized by type for easy identification and quick access. The TechDocs Redirection feature enables permanent links to be created for use in printed materials and other collateral. These links never get "stale" and will always lead to the current doc version. 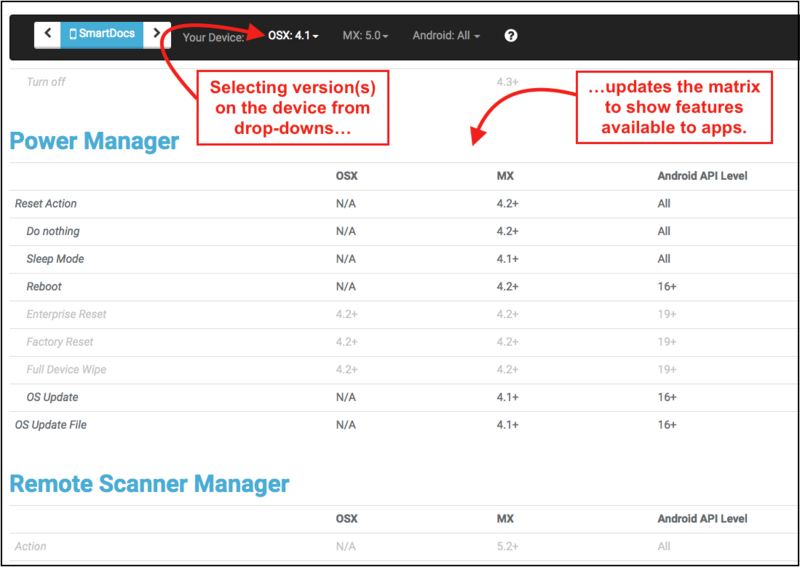 For Zebra’s Mobility DNA documentation (MX and OSX), SmartDocs allows a user to enter the MX, OSX and/or Android version(s) currently running on a device and see a list of the features and capabilities available on that device, helping to reduce development and troubleshooting time and eliminate guesswork. 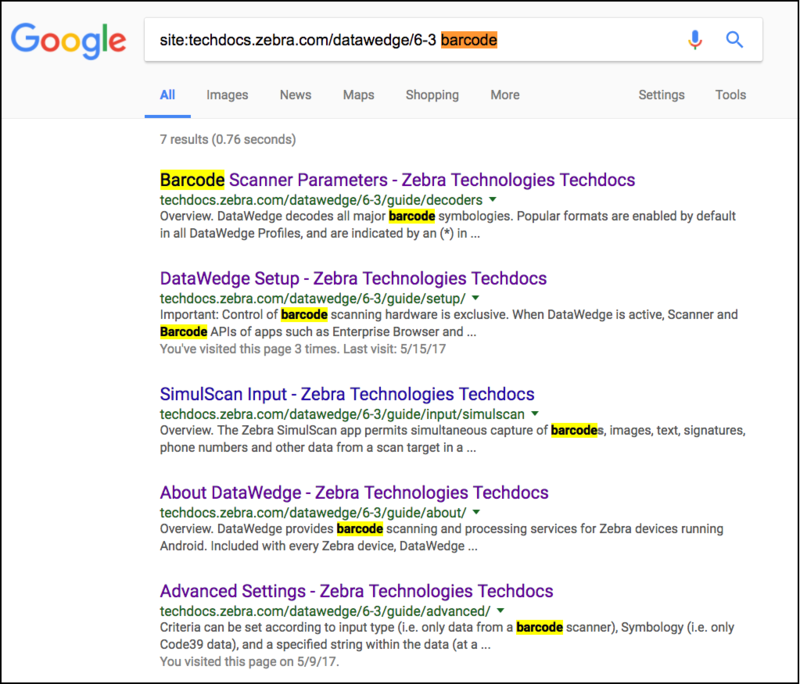 TechDocs integrates with Google Search to deliver results for any product (or the whole TechDocs site) ranked by relevance, enabling users to find the required information as quickly as possible.